In this brief film, a woman is led to the chopping block, forced to kneel and then her head is neatly lopped off. One could imagine audiences fainting at the time and maybe that’s the reason many film buffs call this the first horror film. It’s something even more interesting though: it’s one of the first films to feature an intentional jump-cut and so this is one of the very earliest special effects driven films. 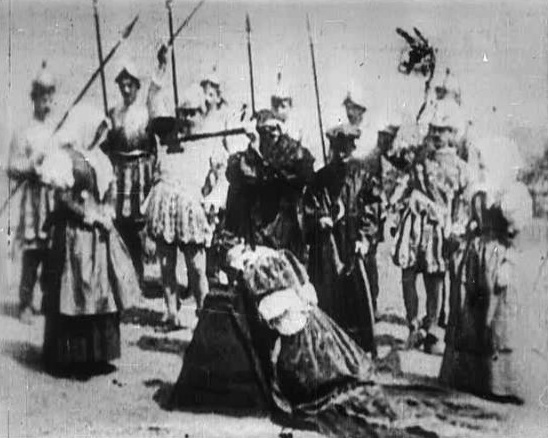 This film features an actress being led to the block and kneeling; then a dummy is placed at the block and beheaded. The cut is really surprisingly seamless, even when you’re looking for it. Perhaps that’s because the quality is poor enough that there’s a lot of debris and grain on the shot as it is. Still, it’s pretty cool and surprisingly sophisticated for the 1890s. 1 star. tl;dr – special effects reproduce a beheading with startlingly good results; probably the most sophisticated film prior to 1896. 1 star.